We live in an interesting time. It wasn’t too long ago that data scientists, industry leaders, and lead developers were imagining what Artificial Intelligence (AI) was capable of. While it’s still uncertain how far we can take AI, the more important question is what can we do with what we already have? AI has moved from science fiction to reality, and innovative creators are finding that they can use it in new and unexpected ways, most notably in customer service. Why Should AI be Implemented in Customer Service? There are many obstacles, both logistically and culturally, which prevent companies from onboarding AI-powered customer service practices. So is it worth the effort? What are some of the benefits of implementing AI for customer service? AI can deliver immediate responses to customers, which is not always possible with human agents. This is especially valuable for companies that do business across global time zones. It would be extremely expensive to staff around-the-clock customer service representatives that could cover every corner of the globe in real time. AI allows companies to communicate 24/7, and with a much smaller personnel headcount. Immediate response can mitigate customer escalation and more importantly customer abandonment. With customer acquisition costs rising higher and higher due to low barriers of entry in the digital marketplace, there is now greater value on customer retention. Ease of use and instant contact can allow companies to redirect some of the resources used for retention into other areas of the business. AI systems are built with the ability to gather unlimited data and not just demographics. In fact, the real value of data collection lies in the gathering of information about a company’s customer interactions. AI customer service solutions can identify trends in customer issues. This data can be used to preemptively design and provide customer solutions that are found to be common within customer experience journeys. AI can also identify patterns in customer behavior, allowing companies to tailor their touch points to match up with the data collected. AI is driven by machine learning. Machine learning uses statistical techniques that empower systems to improve tasks and interactions over time. With this facet of the technology, AI driven customer service solutions allow for greater personalization. Machine learning is what allows AI platforms to predict customer behavior based on collected and processed data from past and current interactions. These predictions can be used for personalized recommendations and solutions, thereby streamlining the journey for the customer and providing a more effortless experience. How Does a Company Implement AI Customer Service? Once a company has identified the benefits of using AI for customer service, how do they implement it? AI technology can be used to create new channels and to augment existing ones. The key is to have an infrastructure that allows onboarding new solutions without creating a hodgepodge of unconnected pieces. The most adroit AI solutions are of little value if they are breaking up a customer journey due to poorly integrated applications. One of the benefits of AI in customer service is that it improves the effortlessness of the customer experience. That benefit is canceled out if a customer cannot easily move within internal channels. Juniper research claims that in the banking and healthcare sectors alone, chatbot conversations will deliver $8 billion in cost savings by 2022. Many people use some form of messaging application every day. Whether a social media app or an internal instant messaging program at work, they are familiar with the concept and comfortable with the format. Chatbots provide a similar format that customers are able to identify with. 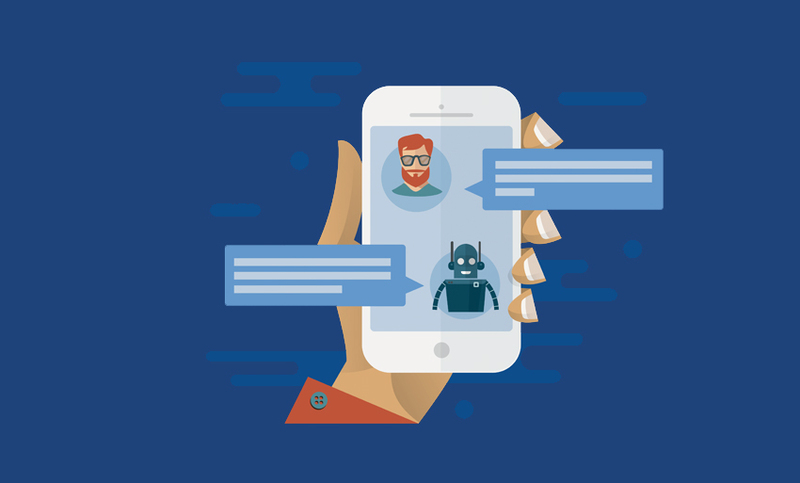 Sophisticated chatbots equipped with collected data are able to identify customer questions based on data points like key words and key phrases. These indicators can trigger pre-constructed answers, moving the conversation along and replicating a one-on-one instant messaging interaction. AI chatbot technology is moving very quickly; however, many will argue that it is still not a perfect solution that can completely replace human agents. With technology where it is today, the best usage of chatbot AI is to leverage it to augment customer service representatives. An example is SaleMove’s OmniGuide. OmniGuide is an agent-facing chatbot that scans all web chat sessions with customers in real time and provides agents with suggested answers to customer questions or actions. AI technology is ever-evolving. The possibilities are exciting in terms of customer experience (CX) and ROI. With CX, AI provides the ability to instantly answer customer questions and carry on personalized conversations in real time. Because of the power of machine learning, AI solutions become more intelligent over time and these interactions will become more laser-focused in terms of customer resolution and satisfaction. For ROI, customer service AI drives down training costs and allows for 24-7 global interactions that would be expensive to recreate with human agents.